Want to be hired by Jena? We have 5 dogs. 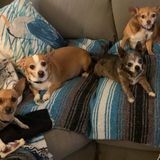 4 chihuahuas and 1 boxer mix. We are going on a camping trip from Wednesday May 15th through Monday May 20th. We are looking for someone, ideally, to spend the night with our dogs and to feed them in the morning and the evening. They are fine with being alone during the day. We will pay $50 per night.